This post is sponsored by Pine Mountain, as always all opinions are my own. We light up our fire pit at least once a week regardless of the season. In fact, when we first moved to England last summer one of the first things we did was to light a fire in front of our house one evening and invited all the neighbors to join us for s’mores as an easy way to meet everyone-who doesn’t like s’mores? 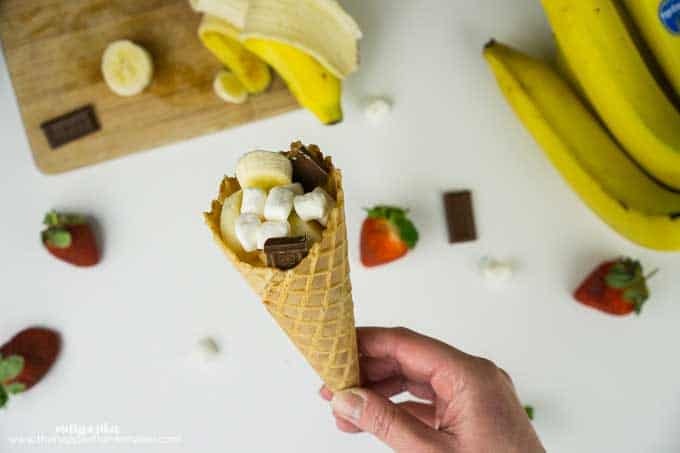 The past few times we’ve made s’mores we’ve changed it up a bit and made these yummy S’mores Cones instead-I love that I can add fruit inside AND it helps keep the kid’s hands mess free! Speaking of that time we invited all the neighbors out, can I tell you-we had the hardest time lighting that fire! My husband is attending an international military course here and we had literally about ten senior military officers from all over the world trying to light that thing and about 25 kids waiting to roast marshmallows-it was chaos. Easy right? So-back to the s’mores cones. 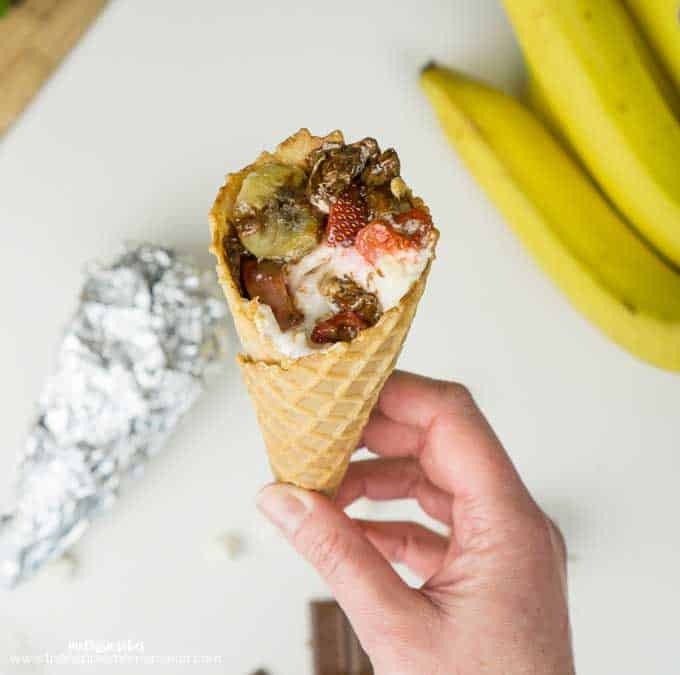 While you’re waiting for the ExtremeStart to work it’s magic, stuff sugar cones full of marshmallows, chocolate pieces and sliced fruit-we used bananas and strawberries and they cooked up wonderfully with the gooey marshmallows and rich chocolate! 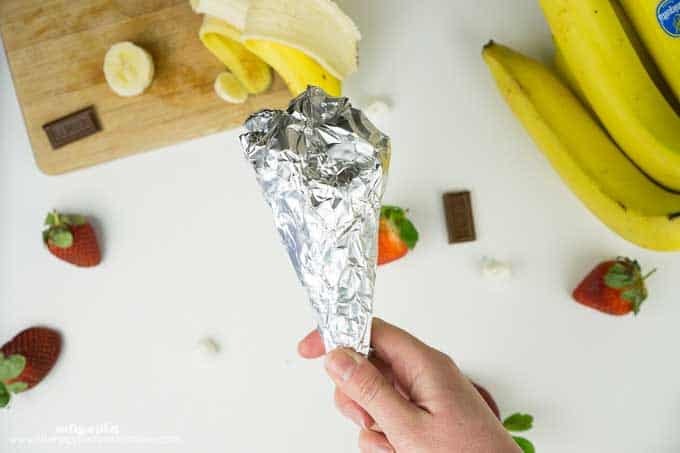 Once your cones are full gently wrap them in aluminum foil and use grilling tongs to hold them over the fire for about 5-10 minutes-if your fire pit has a grill you can also lay them there or even set them just to the side of the fire. You can also use a grill or bake them in a 400 degree oven for the same amount of time. Carefully unwrap them (they’ll be hot!) and enjoy-they really are quite delicious! This is the BEST idea, ever! Love it. I absolutely love this idea! Very smart! 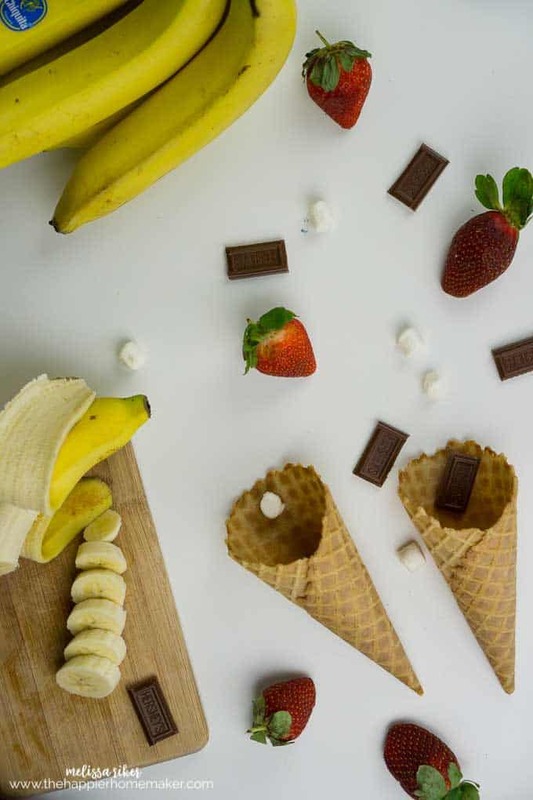 I love this, especially the part where the cones have fruit in them. 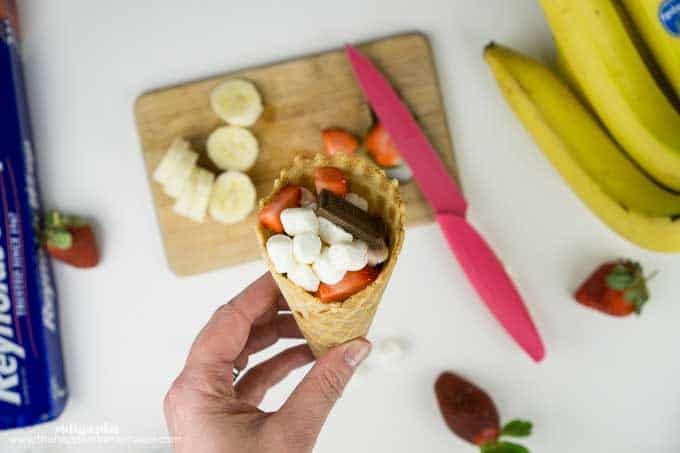 Anything I can do to get my 4yo to eat fruit! It was super smart to invite your neighbors over for smores at the firepit. If one of my neighbors did that for me, they’d have a friend for life.